Growing up in northeast China, Guirong “Grace” Yan didn’t see many tornados in a country where the number of documented twisters is a fraction of those that hit the United States. But as her academic career took Yan to several postdoctoral fellowships and then faculty positions in Indiana, Missouri and Texas, the assistant professor of structural engineering gradually found her calling. As director of S&T’s Wind Hazard Mitigation Laboratory (WHAM), Yan conducts research into wind hazard mitigation and computational fluid dynamics, structural health monitoring, damage detection, and related areas. 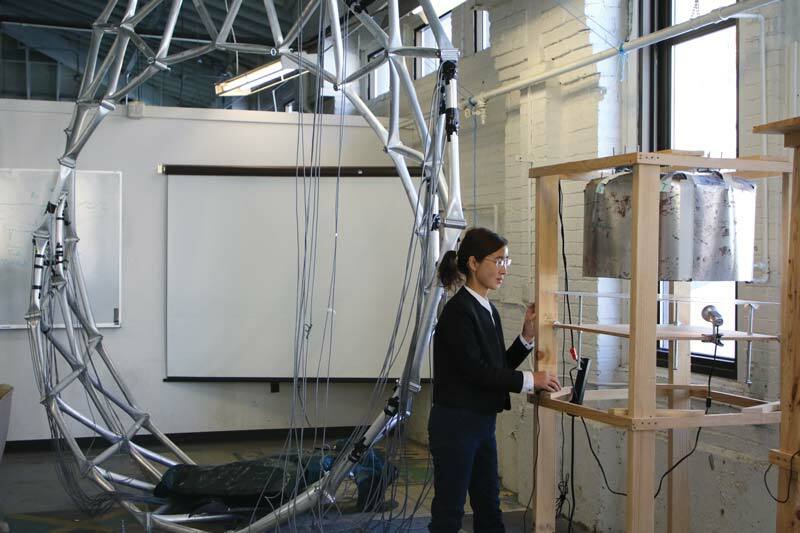 She’s built two small-scale tornado simulators that use toy models to mimic the destruction of high-speed twisters and hopes to build a large-scale simulator that she envisions will make S&T a global leader in her field. Public safety — and preparedness — is central to Yan’s work. That mission is what prompted her to present a TEDxMissouriS&T talk last spring on the vitality of tornado preparation. The talk is available at rol.la/TEDtornado. Yan relied on a pair of analytical observations more commonly invoked in fields such as cognitive psychology, economics or political science — prospect theory and game theory — during her presentation. In prospect theory, researchers have found that people are more willing to endure certain-but-smaller financial losses than take the lesser risk of losing a larger amount all at once, Yan explains. So, in that scenario, paying an annual $5,000 insurance premium over 30 years for a total of $150,000 is still preferable to a one-time loss of the same amount, she says. But those behavioral patterns are also influenced by other human factors, such as complacency. So, Yan is developing a virtual reality animation experience that would allow users to realistically determine how their homes would fare in a tornado. Yan is also tapping game theory — the study of mathematical models of conflict and cooperation among those with competing and overlapping interests — to promote tornado resistance on a broader scale.